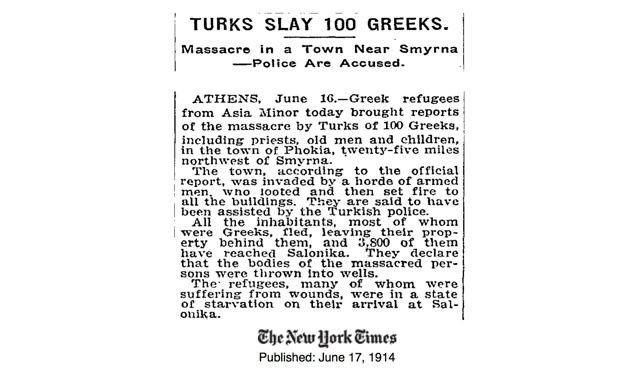 The catastrophe of Smyrna and the events that led to it, including the annihilation of hundreds of thousands of Pontian Greeks almost a decade before the burning of Smyrna, were amongst the most well-documented news events of the time. 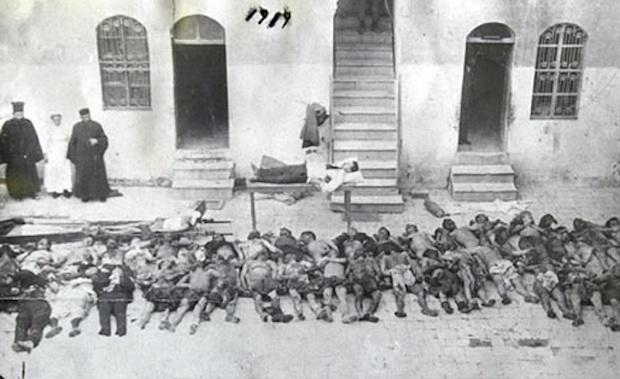 The events have been called, together with the genocide of the Armenians, the first mass genocide of the 20th century, perpetrated by the Turkish nationalists seeing to overthrow the Ottoman Empire and “clean” Turkey of all its Christian inhabitants. Dozens of newspapers and magazines ran stories not only for its news value, but because there was such an American presence there in various forms and capacities. The military was there with war ships in the harbor, as were countless US aid workers, government officials and even missionaries and education officials running schools and orphanages throughout the region. 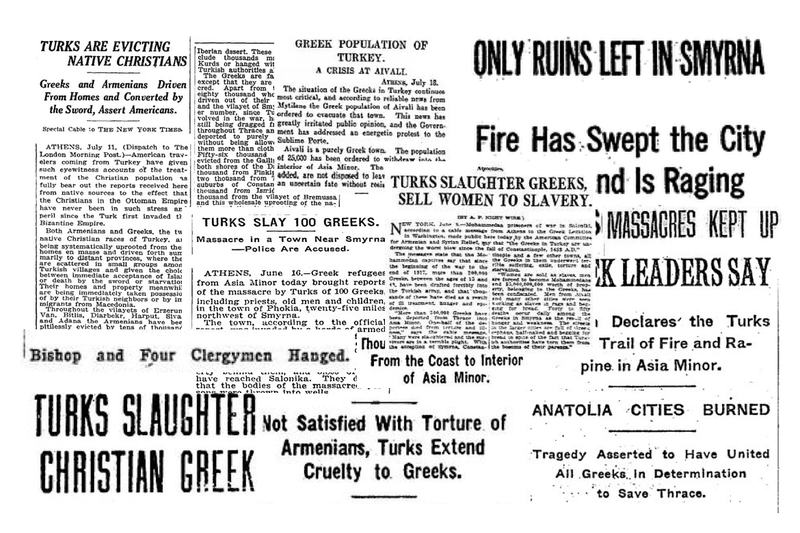 Here is just a sampling of the headlines that appeared in US newspapers at the time. 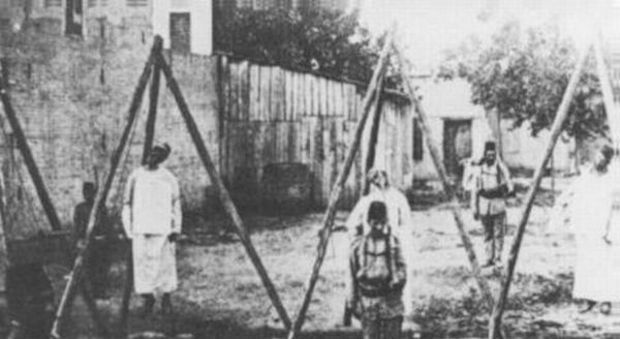 Incidentally, two decades later, the world would witness once again, the Holocaust of the Jews by the Nazi Germans. History does repeat itself indeed. 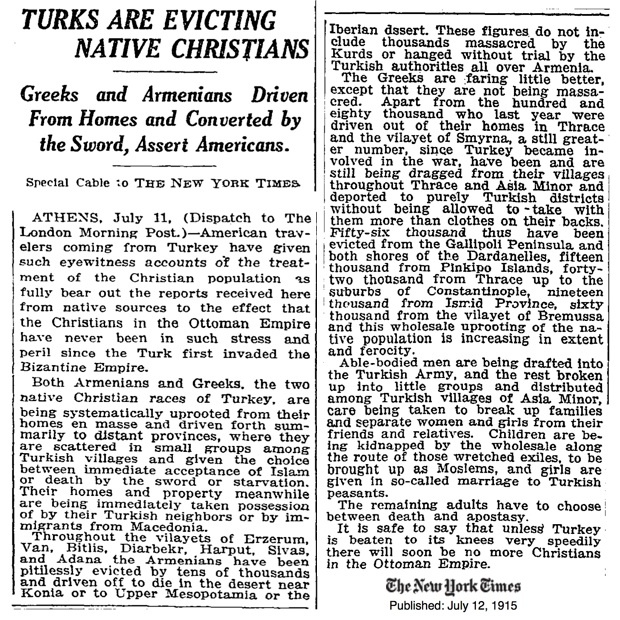 It is chilling to read the newspaper headlines covering Turkish atrocities against the Christian Greeks– deportations, mass murders of innocent civilians, trains to labor camps– and not be impacted by the similar tactics used by the Nazi Germans. to think my grandparents lived through this…. does the world ever learn? 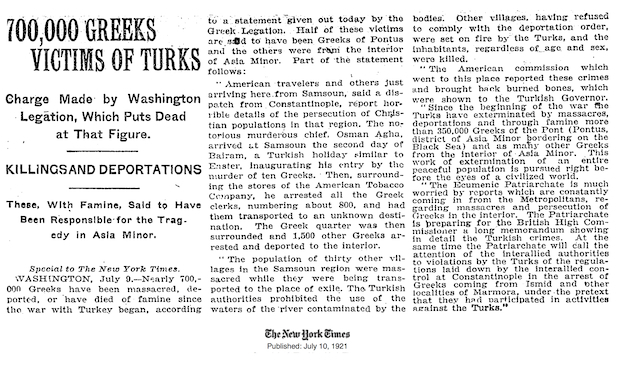 Now I understand the stories that my grandpa was telling us kids, how they had left and came to Thessaloniki..
“Turkey massacres millions of Greeks”. Yeah sure! 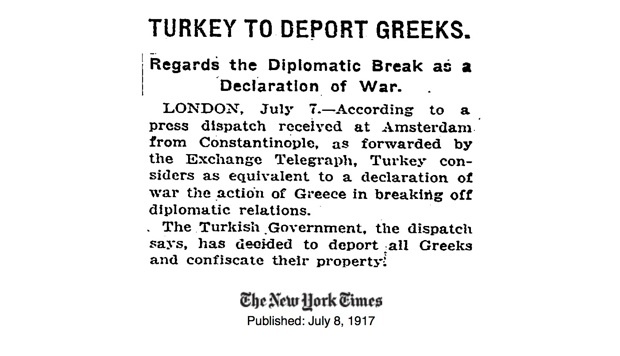 Why don’t they first bother to ask what the Greek army was doing in Anatolia, the land that was ruled by the Turks for the last couple of centuries. The truth is: the Greeks raised to the bait of English and Americans and clumsily lost the war, in which they were backed by superpowers. Stop playing the victim. Joost ; the greek army was there to protect the greek citizens from the barbarous turks who after thousands of years of having been originally settled by greeks in many towns of Asia Minor (Turkey) the turks now felt their larger population than the greeks and other minorities gave them the authority to kill these original inhabitant greeks and Armenians and jews and gypsies in order to feel as if they finally made it in the world and be known by the name of their murderous leader Ataturk.